Directions: Make a "newspaper hat" out of a piece of white butcher paper. At the top of the hat's front side, write the name of your book and the author. Divide the front brim into three sections. In the first section draw something that happened at the beginning of the book. In the middle section, draw something that happened in the book's middle. In the last section, draw the problem of the story. Then divide the brim on the back of your hat into two sections. In the first section, draw how the problem was solved. In the last section, draw something that happened at the end of your book. 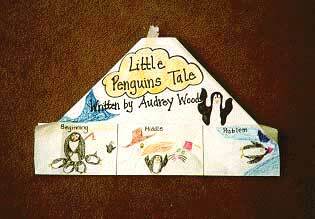 The example shown below is the model made by a first grade teacher based on Audrey Wood's Little Penguin's Tale.